Beware when you get to be a septuagenarian. 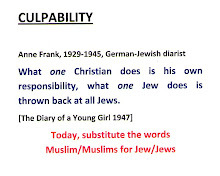 You reckon you are due for a change ......and deserve a peaceful sojourn on this earth in the time you've got left. But no; a leaking roof, failing internet connection, sick pet (Rusty the cat, not the spouse), a fall down the stairs, and chronic insomnia have been on my plate since the last posting. I was becoming quite frustrated because a number of drafts I started could not be completed. I put it down to decrepit old age - time maybe to settle down in my rocking chair and do something quiet and placid like embroidery! If I were back in Leicester I could turn into a couch potato and watch re-runs of cowboy stories (like Bat Masterson) and mystery thrillers (like Perry Mason) on TV or make frequent forays to the Charity Shops in the City Centre! My case numbered Item 94 titled 'Reference on Singapore' which arrived in the container from Leicester to Setiawangsa in 2008. Amongst other treasures in the case was that precious book 'Malay Participation in the National Development of Singapore' (1971) edited by Sharom Ahmat and James Wong. 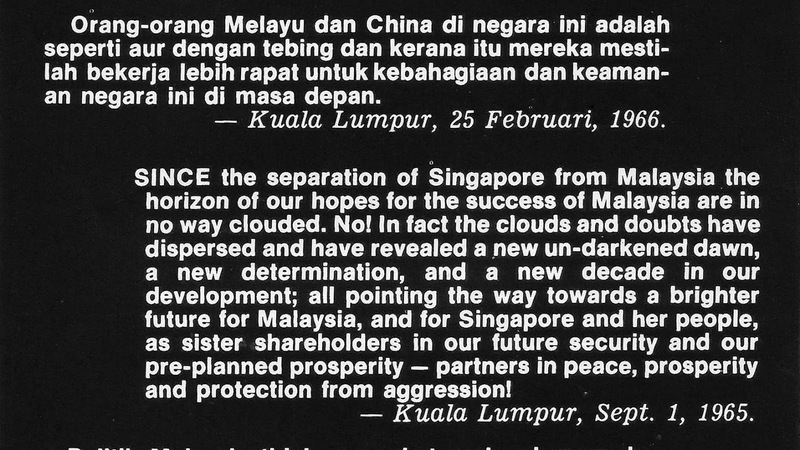 Amongst other goodies, I discovered a file of newspaper cuttings from The Straits Times in April 1990 referring to news about Malaysia - about her Prime Ministers. 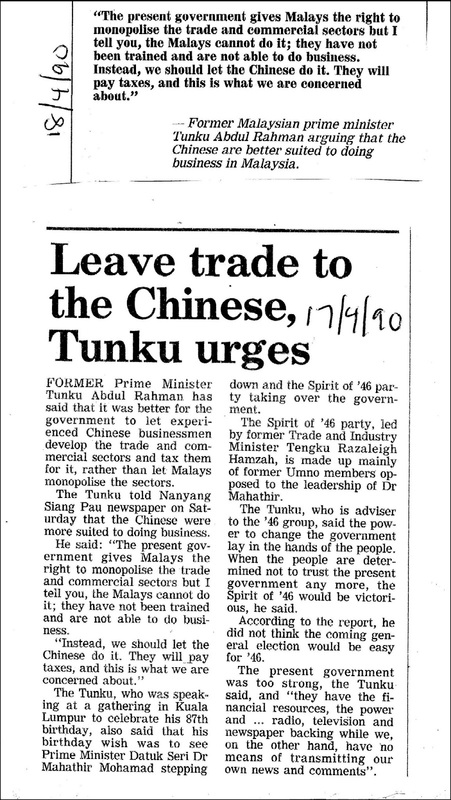 That the Chinese should be given the right to monopolise trade and commerce because they are better at it is quite a startling statement from the first Prime Minister of Malaysia. Monopoly of any sector of a country's economy is bad news for any nation. And to justify this in terms of the taxes that the monopolist will contribute is exactly the argument used by the chauvinists to exert their superiority and to denigrate the incapacity of the Malays! The fourth Prime Minister's suggestion for the implementation of the NEP (30% of the economy be allocated to the Bumiputras, 40% to non-bumiputras and the rest to foreigners) revealed another cloud-cuckoo-land vision. "What we want to see is that the wealthy Chinese conduct businesses according to the NEP. They should bring the bumiputra into their firms, accept him, train him to work and expose him to business risks - not just to use him as a front." 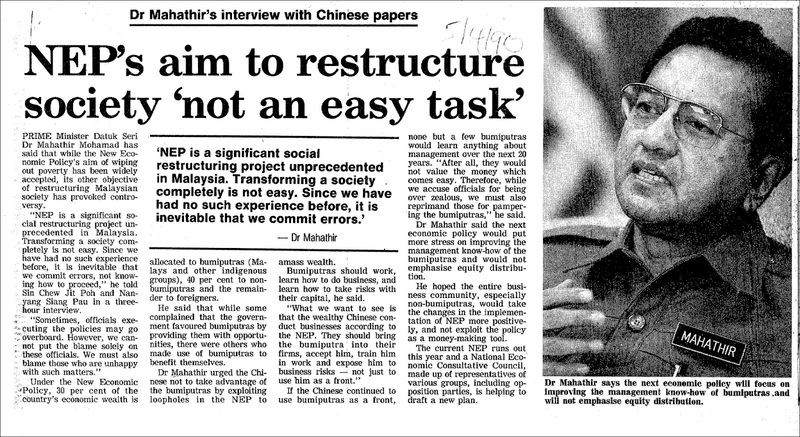 Was this the blueprint for cronyism in Malaysia? mornings catching up with the news. I was just two years away from starting a teaching job in USM and when I saw these items from April 1990, I just had to bring these cuttings back to Leicester together with my supply of ikan bilis and my mother's sambal pedas pucuk ubi/ikan bilis. They more or less prepared me for the vagaries of working life in a Malaysian University. I gave up after only two years - too much "sound and fury" (from both the Academics and Administration) "signifying nothing". In contrast, I worked for six and a half years in Brunei but that was a different scenario. 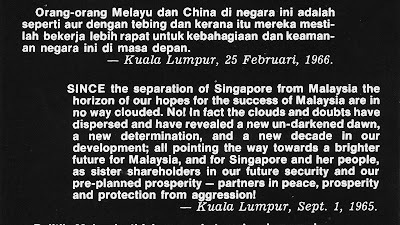 In 1978, when I left for Brunei, I was desperate to escape the straitjacket in Singapore! 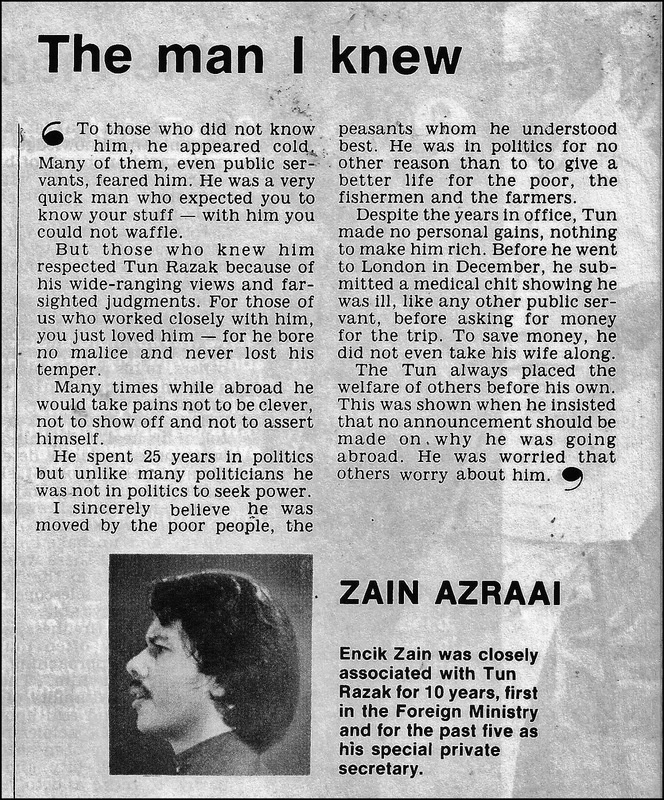 As for the third of my three Prime Ministers, it was heartwarming to read this of Allahyarham Tun Razak, the second Prime Minister of Malaysia. "In the ten years that Razak was Minister for National and Rural Development, nearly three million adults were taught to read and write. The British took nearly a century to build two thousand schools; the Tun took ten years to build three thousand more. 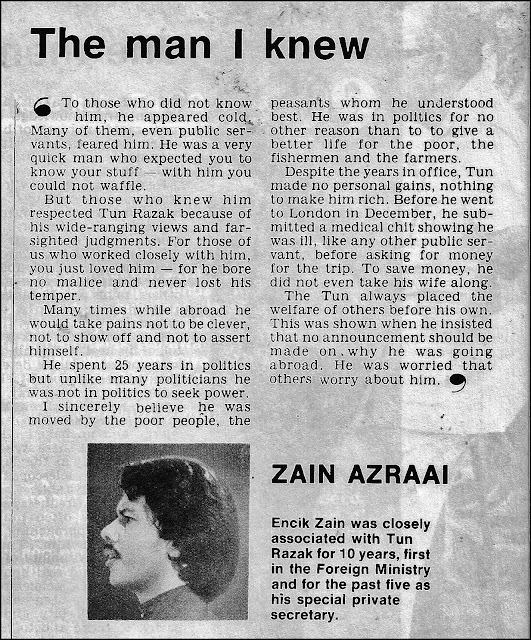 When I was in Singapore University during the mid-60s, my (Chinese) fellow undergrads labelled Tun Razak a racist , but they all agreed that he was made of sterner stuff than Tengku Abdul Rahman and would be a formidable leader of Malaysia. 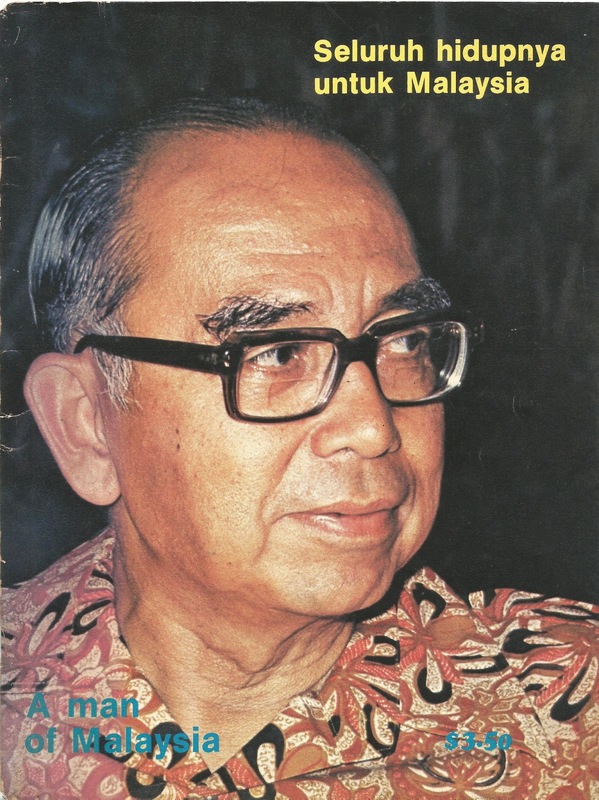 Tun Razak was the right man at the right time to take over as Prime Minister after May 13 1969. Maybe there will be people out there today, in their mid-40s, collecting newspaper cuttings, electronic folders, books and publications of our other Prime Ministers. 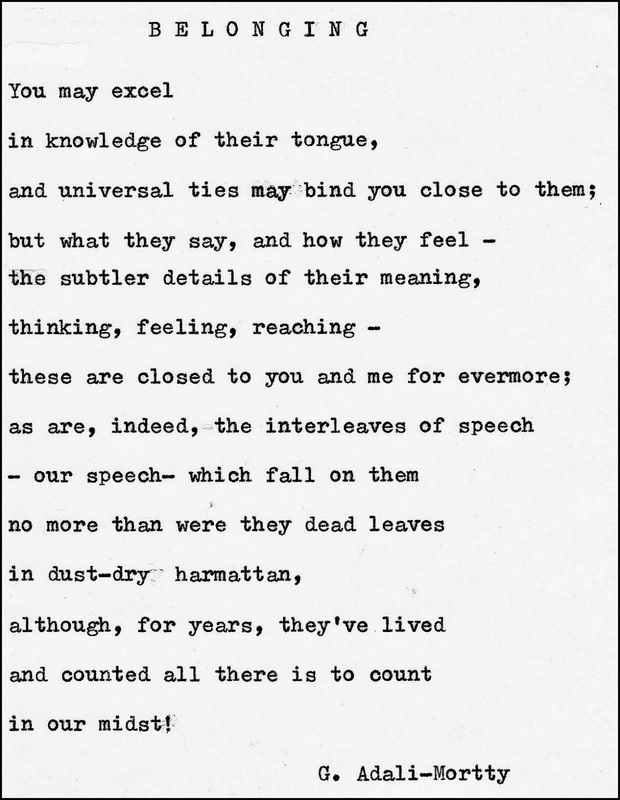 And when they become septuagenarians, they might begin to pore over their collection - with sad eyes and despondency.